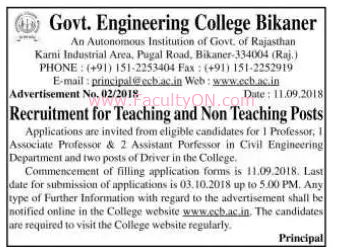 Government Engineering College, Bikaner has advertised in the PATRIKA newspaper for recruitment of Professor / Associate Professor / Assistant Professor Plus Non-Teaching Faculty jobs vacancies. Interested and eligible job aspirants are requested to apply on or before 03rd October 2018. Check out further more details below. About College: Government Engineering College Bikaner, located in Bikaner, is an autonomous educational institution of the government of Rajasthan, India. The institute was affiliated with the Rajasthan Technical University. (i) Sight 6x6 with or without glasses. (ii) Knowledge of roadside repairs and efficiency in Driving to be examined through a Trade Test by the Appointing Authority. How to Apply: Interested and eligible candidates are requested to send application form in prescribed format along with required documents to the following postal address only through registered post / speed post.